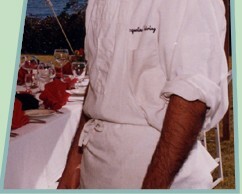 Chef David Goldberg has over 20 years' experience in the restaurant and catering industries. 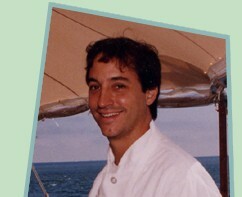 As Sous Chef and then Chef of the Allegro Restaurant in Waltham (currently The Tuscan Grill) between 1987 and 1990, David learned the beauty and importance of using only the freshest meats, poultry, produce, and herbs, and was trained with some of Boston's finest chefs in the art of Northern Italian cookery. When David was recruited as Head Chef for savory foods at the Bentonwood Bakery and Cafè in Newton, he enjoyed the creativity of developing up-scale menus in the bistro tradition. At Cincinnati's Chateau Pomije Restaurant and Wine Bar, between 1992 and 1994, David directed the catering department and honed his now famous slow-cooked ribs with all the fixins'. Finally, Dave's love of fishing and the ocean brought him back to Massachusetts, and in 1994 Jacqueline's Catering was born. Since then, he has orchestrated hundreds of weddings, family parties, and corporate events, both on- and off-site. Because Dave is both Chef and Owner of Jacqueline's Catering, you will never deal with anyone else in the planning and execution stages of your party. Small wonder that, in the words of one satisfied customer, "Our wedding was perfect, and we could not have done it without David. Guests are still talking about it over a year later!"